When Florida became a State in 1845, the Constitution previously proposed by the Territory of Florida in 1838 became the state's first Constitution. Interestingly, the 1838 Constitutional Convention was held in Port St. Joe, on the Gulf coast southwest of Tallahassee. A museum in Port St. Joe commemorates these events. This Constitution created a Supreme Court but gave it no Justices of its own. 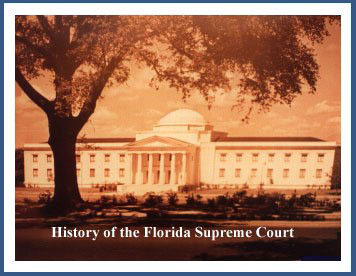 The powers of the Court were vested in the judges of the circuit courts (the name Florida gives to its trial courts). The circuit judges were elected by the Legislature, collectively serving in the capacity of Justices of the Supreme Court from 1846 until 1851. During this period, there were four judicial circuits in the state; therefore, the maximum number of circuit judges serving as the Supreme Court was four. The circuit judges sat as a body to review the decisions of the individual members. In 1848 the Constitution was amended, and in 1851 authorizing acts were passed providing that the Supreme Court should have its own Justices -- a Chief Justice and two Associate Justices. These Justices were elected by the State Legislature for the term of their "good behavior." In 1853 an amendment provided for the election by the people of the Justices for six-year terms. The 1861 Constitution provided for the appointment of the Justices by the Governor, with the advice and consent of the Senate, to serve for six-year terms. In 1868 following the Civil War, a new Constitution was adopted calling for a Chief Justice and two Associate Justices to be appointed by the Governor and confirmed by the Senate. These Justices were to hold office "for life or during good behavior." The 1885 Constitution provided for the election by the people of three Supreme Court Justices to serve six-year terms. In 1902, an amendment increased the Court's membership to six Justices and permitted the Legislature for the year 1905, and for subsequent years, to provide for three to six Justices to serve terms of up to six years. In 1911 the Legislature reduced the number of Justices to five. In 1923 the number was again raised to six and continued to be six until a 1940 constitutional amendment, which called for seven Justices, the present number. The 1885 Constitution provided that the Chief Justice of the Supreme Court be designated by lot. A constitutional amendment in 1926 provided that the Chief Justice be selected by the Justices of the Court; this is the current method of selection. If the Chief Justice is unable to act for any reason, the Justice longest in continuous service -- also called the Dean of the Court -- acts as Chief Justice. Prior to 1868, the Supreme Court met where and when the Legislature provided. The Constitution of 1868 provided that the Court hold three terms a year "at the seat of government." In the Constitution of 1885, there was a similar provision, except that the number of terms could be regulated by law. Now, the Court holds two terms each year in the Supreme Court Building, commencing respectively on the first day of January and the first day in July. Oral arguments are heard by all seven Justices. The Court appoints a clerk, a marshal, and a librarian to assist in its judicial duties. In addition, each Justice has assistants who are attorneys called law clerks. Interestingly, two former law clerks returned to the Court as Justices. They were James C. Adkins and Wade Hopping. 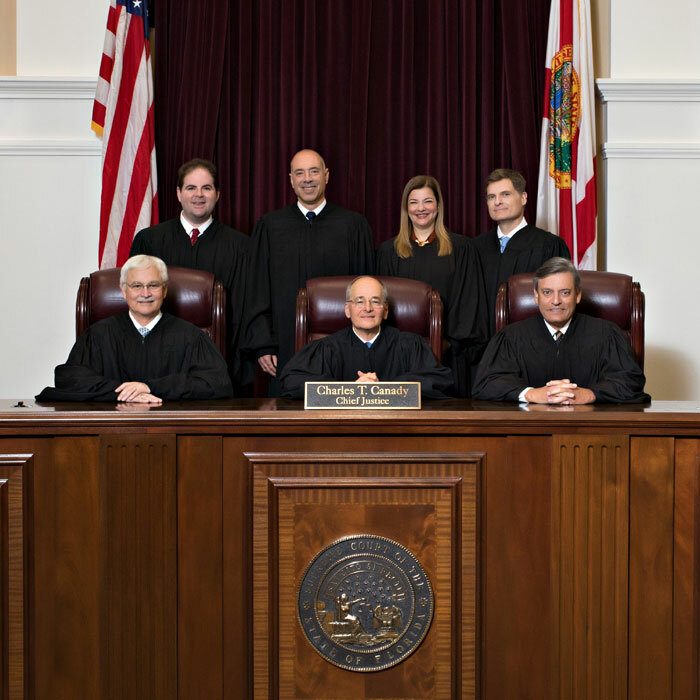 Three Justices became Governor of Florida after serving on the Court; one was Governor and one was Lieutenant Governor before serving on the Court. Nine served as attorney general. Eight were members of the legislative body of the Territory of Florida. Twenty were members of the State Legislature; four were members of the Constitutional Convention of 1885; and three represented Florida in Congress. One Justice, Joseph W. Hatchett, resigned to become a judge for the United States Fifth Circuit Court of Appeals; another, Rosemary Barkett, resigned to become a judge on the United States Eleventh Circuit Court of Appeals. One was a United States judge for the Middle District of Florida during territorial days. Another, Justice H.L. Sebring, took a leave of absence to serve as a judge of Military Tribunal I for the war crimes trial at Nuremberg, Germany. At twenty-nine years old, James D. Westcott, Jr., was the youngest to serve, and Glenn Terrell served for the longest period -- forty years and seven months. Three women have served on the Court, Rosemary Barkett appointed in 1985, Barbara Joan Pariente appointed in 1997, and Peggy A Quince appointed in 1999. Justice Barkett became the first female Chief Justice in 1992. Four African-Americans have served on the Florida Supreme Court. The first was Joseph Hatchett. The others in chronological order are Leander J. Shaw, Jr., Peggy A Quince, and James E.C. Perry. The first three Justices ever to serve on the Court were George S. Hawkins, Thomas Baltzell, and Thomas Douglas. They came respectively from Jackson, Leon, and St. Johns Counties -- all located in North Florida, where the majority of the State's population lived at the time statehood was granted. From 1885 until 1925, the Florida Constitution established a very unusual method of choosing Chief Justices: It was done "by lot." The Justices found the idea of cutting cards or other games of chance undignified, so they settled upon a very special method. They would take the Bible or a newly purchased law book and each would randomly open it. The Chief Justice was the one who opened a page whose first word began with the letter closest to the letter Z. During the Civil War, a number of entries in the Court's minutes reveal how much Florida was disrupted by the hostilities. In 1863, the Court was forced to appoint a temporary Clerk of the Court after the actual holder of that office was taken prisoner of war by Union forces. On December 23, 1863, the Court minutes noted that the Justices were unable to conduct their regularly scheduled session in Jacksonville because the courthouse had been destroyed "by the enemy." On February 16, 1864, Justice William Forward was unable to attend the Court's session "owing to the invasion of the enemy." On February 21, 1865, no sheriff or deputy sheriff could be found to serve as bailiff, so the Court appointed a county coroner to serve that function. That same day, no minister could be found to say the opening prayer, which the Court simply dispensed with. From 1846 to 1851, Justices served a dual role as both appellate and trial-level judges. As a result, they were expected to "ride circuit," meaning they had to travel by horse or carriage to the major cities of the State. Many qualified persons were deterred from becoming Justices simply because of the arduous travel the job required. Florida was the least populous Southern state at the time, and the population largely was concentrated in the north. Persons living in extreme South Florida commonly had to travel to more northerly places like Lake City so that their lawsuits could be heard by one of the Justices. When the eastern portion of the present Supreme Court building was built in the late 1940s, an odd collection of materials were placed inside the cornerstone. Among the items still inside the cornerstone is a photograph of a Seminole Indian Chief playing golf at Fort Myers.